Not every company runs the same way, especially when it comes to scheduling work. We want to make your life easy, so you don’t have to think twice when chatting with a client about when you can make it to their property. And, if things change (because that’s just life), we make it easy to adjust your schedule. Create a job, choose a client, and assign it to your team with only a few clicks. Scheduling in Jobber gives you the flexibility you need to book jobs, tasks, and events—faster. Job (Green): Schedule incoming jobs as one off visits or recurring contracts. Basic Task (Blue): Use basic tasks to schedule anything you won’t be invoicing for. Calendar Event (Yellow): Add items that your entire team can see in their schedule. Visit (Yellow): Schedule multiple visits for multiple clients at once. On-site assessment (Purple): Schedule work requests to start the quoting process. Personalize your calendar with Jobber’s color coding and filter the tasks you want to show or hide on the calendar, and assign calendar colors to certain users, or tasks that have key words in the title. You can also sort your calendar items by status—such as unscheduled, overdue, upcoming, or completed—so that you don’t miss any tasks on your to-do list. Jobber’s multiple calendar views are ideal for dispatching your team efficiently. Choose from five different views when managing your team’s schedule, to get a clear visual of availability for multiple team members to avoid overbooking, underbooking — or the dreaded double booking. Month and Week view: provides a great overview of all your jobs and assigned employees. 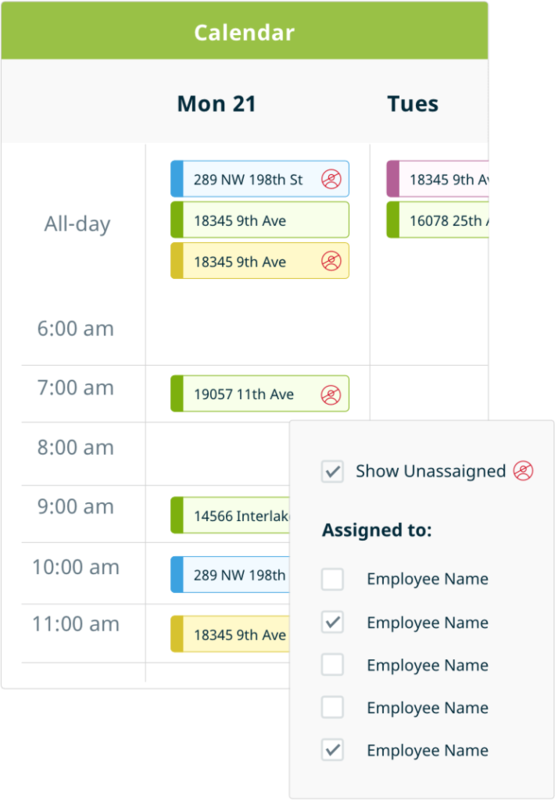 Grid view: allows you to quickly move visits between assigned employees and times. Map view: shows you who is working where, and allows for daily routing. List view: provides an overview of your tasks for multiple months on a simple scrolling list. Easily reschedule jobs to different days or times, or reassign jobs to a different crew or team member. It’s literally as simple as clicking, dragging, and dropping. 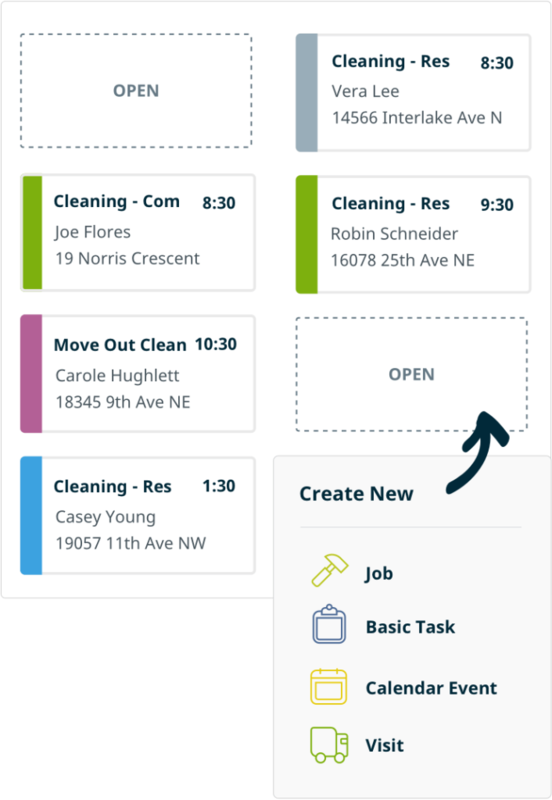 Make scheduling decisions on-the-fly with the Jobber app. When a new job comes in, you can easily toggle back and forth between the day view or list view to see your availability at a glance. 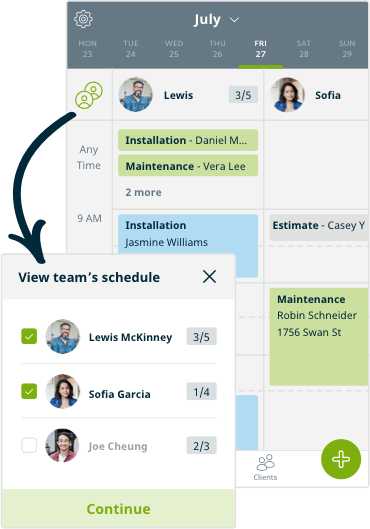 You can also compare team member schedules with team view, side-by-side availability in the Jobber app that makes it easy to see who’s free—on the spot. Choose an available time slot, then tap to immediately start scheduling a new task or job. The progress indicator gives you a feel for how much each team member has on their plate for the day so you can assign or reassign jobs to the right people. It shows how many jobs they’ve completed out of the total assigned to them that day (e.g., 2/7 → 2 completed of 7 assigned). When you make a schedule change to an employee’s current workday they will receive a notification on their phone within a minute of you making the change. They’ll get a notification in the field if they have a new, rescheduled, or cancelled visit that day. Can Jobber handle recurring jobs? You bet! Jobber handles recurring jobs really well. Whether your job is just one visit or 100 visits, whether you visit your client every Tuesday, or every Third Friday of each month—you can customize your recurring schedule. And, if things change (because that’s just life), we make it easy to move or edit future visits for a job. How does Jobber handle unpredictable weather? Sometimes unexpected weather means you need to visit all your clients on the same day or move all your visits to a new day! You don’t have time to get lost in administrative tasks and Jobber helps organize your business and put you to work quickly. Jobber’s bulk scheduling allows you to easily schedule multiple visits for multiple clients at once. What’s the difference between a job and a visit in Jobber? Great question, I’m glad you asked. In Jobber, you can think of the job as the contract to do the work, and the visits as the individual days when you or your team are doing the service.